This Advance Tabco PRB-19-53C three compartment Prestige series underbar sink is part of a complete series of upscale underbar equipment. Items found within the Prestige series of underbar equipment line up perfectly with each other, creating a uniform look across any bar. In addition to other great features, this sink comes with two 12" drainboards and a 12" long splash mount faucet for greater convenience during installation and use. Its compact design makes it the perfect solution for bars or cafes that have limited space available. 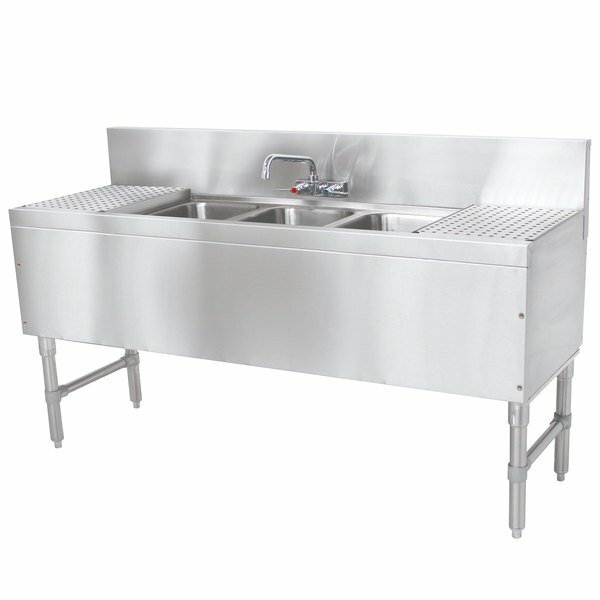 This sink is made of 20 gauge 300 series stainless steel and is designed to fit into your current counter to save space. The extended 7" backsplash helps protect the surrounding area from drips and splashes during use, and the entire unit is sound deadened so that you can use it during peak business hours without worrying about extra noise. The 12" drainboards are built in on either side of the sink bowls. They come perforated to allow for faster draining of wet items, and the tops are removable for easy cleaning and maintenance. This sink's three single piece deep drawn compartments are 10" x 14" x 10" and have 9" high overflow pipes and 1 1/2" IPS drains. This unit comes with 1 5/8" diameter 18 gauge stainless steel legs that install with a simple twist. In addition to this exclusive twist-action assembly for added strength, the legs are tipped by stainless steel adjustable bullet feet to help ensure stability and account for any unevenness in the floor.